Yes hats are back, and bigger than ever – colloquially and physically, it seems. 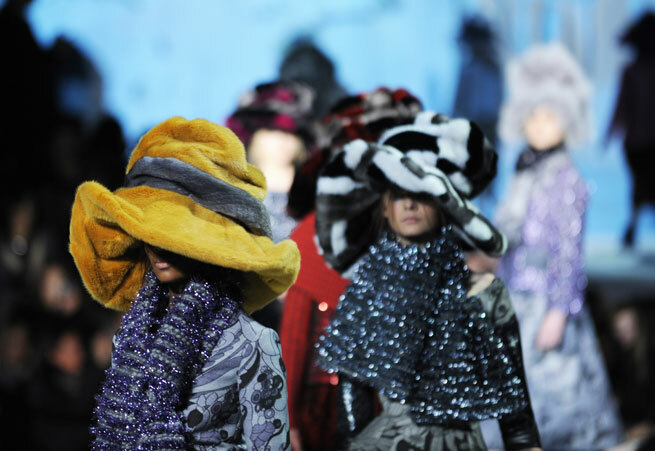 And despite many being made of fur, hats this season go well beyond the purpose of warming the body or symbolizing authority and social strata (or merely masking a bad-hair day). The top hat, for example, originally associated with 18th century gentlemen of the upper class, reemerged this season on the Ralph Lauren runway adding androgynous charm to its formal, preppy fashions. Donna Karan added a feminine twist to the top hat trend making them miniature in size and somewhat like a fascinator in style, while Jean Paul Gaultier paired them with tuxedo jackets with tails in Cabaret-esque ensembles. Other retro-inspired hats like the newsboy, cloche, bowler and fedora popped up everywhere from Lacoste to Armani, serving as significant parts of the designers’ collections and emphasizing the role of the hat for fashion over function. So, go ahead, channel your inner “Fair Lady” or your inner masculine sense of authority (turned sense of mode) and hold your head high in this season’s ultimate fashion accessory – and do so even on a good hair day.